1. Mix the oil, half the mint and the cumin in a large bowl. Add the meatballs and toss to coat evenly. Thread the lamb, alternating with the peppers, on to 8 skewers. Place on a foil-lined grill pan and grill for 15 minutes, turning every now and then until thoroughly cooked with no pink meat. 2. Meanwhile, cook the couscous in boiling water for 8 minutes, then drain and cool under cold water. Stir in the remaining mint, pine nuts and yogurt, and season well. 3. 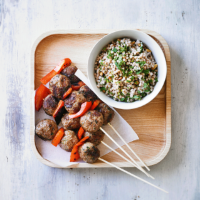 Serve the couscous with the lamb skewers and salad. This recipe was first published in Thu Mar 24 09:13:00 GMT 2016.